The Press recently carried a story on the increase in the number of applications to turn shops into homes. The change of use from retail to residential is usually approved if there is no longer a local need for the retail provision. I’m sure I’m not the only one to have noticed that this trend isn’t a new one, and that many small corner shops have quietly disappeared in the terraced streets beyond the city centre. I don’t know if their passing is lamented in the communities they used to serve. But I know that many were very sad to see the closure of this small local shop, and that many of us still miss it. Whiting’s on Bootham closed in March 2010. These photos were taken not long afterwards. Like so many others, this shop is to be converted to residential use. Or rather, converted back, as it was originally a house. I doubt anyone remembers that, as it is known to have been a shop since the 1950s and probably earlier. This shop was part of the Spar franchise when I knew it, but it wasn’t like the other Spar shops. It had a delicatessen counter at the back, just one of many features which made it rather classy. It was small, a family business, well-established, known by everyone local and knowing everyone local. Not an empire, just the one shop. They were open until 9pm and the lights were on in the back of the shop past that. Old-fashioned service and working hard, all hours, and caring but not making a show of caring. For about five years I lived very close by. Close enough to lean out of my front window and discuss with a member of their staff whether they had any candles, when we had an unexpected power cut one evening. When I moved, and wanted a bottle of champagne to take to the new house, and mentioned to Mr Hugill my pot of accumulated small change that would just about cover it, they were gracious, kind, discreet in provision of empty cash bags and receipt of the full ones, and didn’t make me feel like a pauper. As if paying for Moët in bags full of coppers and 10p pieces was a normal thing to do. It was some years back that the business was put up for sale. Most customers were probably unaware that it was, unless they’d seen, as I had, the details in the window of an estate agents office in town. I don’t remember it carrying a big ‘For Sale’ sign. Maybe they didn’t want to distress their customers. Whiting’s did feel like a bastion of the community, a safe place, somewhere that would always be there. 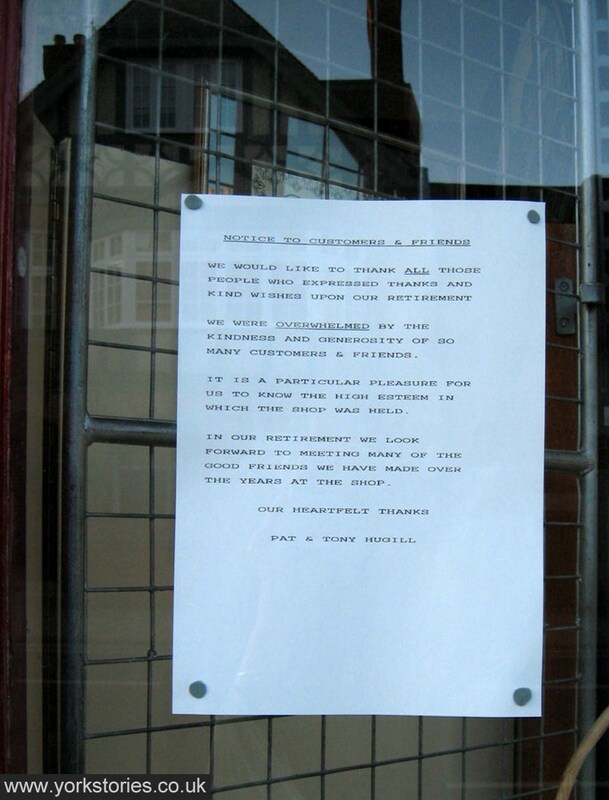 It didn’t sell, as a shop, despite the decades of loyal service to the local community. The increasing competition of the developing ‘retail offer’ around it reflected wider changes, as shops improved their ranges and extended their opening hours. The newsagents a few doors down became a Londis, open until 8pm. The Jackson’s store at the top of Bootham became one of the Sainsbury’s Local stores, and was probably where those walking home along Bootham would call first. 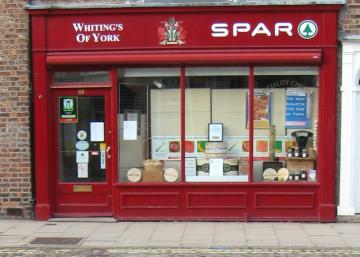 So, there was no need for 69 Bootham to remain as a shop, as the long and unsuccessful wait to sell it as such seems to have proved. On paper, this retail facility was no longer required. I wasn’t aware of any complaining on the part of the owners. I don’t remember them blaming Londis or Sainsbury’s for taking away their trade. It’s just the way of things, isn’t it. Shops come and go, like everything else. Though we regulars knew what a loss it was. I was just one of many people who wrote a card when the shop closed and the owners retired. It’s nice to see them, as I sometimes do, walking up Bootham in a leisurely fashion, rather than having to dash to the front of the shop to the till, or restocking the shelves. They worked so hard, and yet somehow managed to have a shop where customers always felt calm, unhurried. It’s only now, in June 2012, that the conversion is underway. The window display has gone and the door displays those warning signs you see on building sites. One day soon people will be sitting watching TV near where the deli counter used to be, with perhaps a bookcase where once was a fridge full of Longley Farm yogurts. I also have lived very close by to Whitings, close enough to refer to it as ‘next door’. I could do all my shopping there, from toothbrushes to cheese to spring onions.. it was like having a private larder / food cupboard / wine rack that i could dip into whenever i wanted, staffed by courteous, friendly, but not too over-familiar, staff, who were always willing to pass the time of day with you if you wanted. i too have offloaded several Kg’s of very small coins onto them, having bags of coins cheerfully weighed on the scales usually reserved for goods from the deli counter..
and i too have bumped into the owners down Bootham, looking relaxed and cheerful, rather than forever busy from dawn to dusk, and its still a pleasure to swap a few pleasantries with them. i still live in the same home, but its never felt quite so ‘homely’ since Whitings closed, they helped give me a sense of community, of belonging, of my own little shop where they knew me and i knew them..
Glad it wasn’t just me with the bags of change! You captured what I was struggling to say – in the last bit of your first paragraph in particular. It was that ‘if you wanted’ – they always seemed to get it right. We lived in the old almshouses at 90 Bootham opposite Whitings. I used to be able to get over to Whitings, buy something, and get back indoors, during an advert break! We also use to play a game with dinner guests, saying to them, “Name your dessert and we will do it for you.” Whitings would come up trumps, and at high speed. Belated thanks to the late Mrs Whiting and Mr Hugill. I hope you have a long and happy retirement. You deserve it.